The CTD unit was a Sea-Bird 9/11 plus with dual temperature and conductivity sensors. All other instruments were attached to a Sea-Bird 32 12 or 24 bottle Carousel Water Sampler, equipped with Ocean Test Equipment Inc. Standard 10-litre external spring Niskin-type water-sampling bottles. The table below lists available information about the various sensors. Samples were collected using acid-cleaned 5 L, Teflon coated, externally sprang, Nisken bottles attached to an autonomous rosette (Model 1018, General Oceanics, USA). No sensors were attached to the rosette. The CTD system was deployed using a 12 mm diameter Spectra rope (Donaghys, New Zealand). The data arrived at BODC in 51 ASCII files which were reformatted to BODC internal QXF format (subset of NETcdf). Times were converted from NZST to GMT. Reformatted CTD data were visualised using the in-house graphical editor EDSERPLO. No data values were edited or deleted. Quality control flags were applied to data as necessary. Once quality control screening was complete, CTD downcasts for all casts were loaded into BODC's National Oceanographic Database (NODB). Fofonoff, NP and Millard, RC (1983). Algorithms for computations of fundamental properties of seawater. UNESCO Technical Papers in Marine Science No. 44, 53pp. A total of 71 CTD casts were completed during the cruise TAN0609. Both a stainless steel (51 casts) and a trace metal sampler (12 successful casts from a total of 20) were used. Salinity and oxygen samples were collected to calibrate the CTD sensors. Salinity measurements were made on board using a Guildline Autosal 8400B salinometer. No CTD data are available for the trace metal rosette sampler. All other CTD data was processed to NIWA Ocean CTD Facility (NOCF) level 2 processing specifications. The raw data files were processed using SeaBird's software, SBE DataProcessing-Win32. The following routines were applied. Wildedit - for each of temperature (x2), conductivity (x2), pressure, dissolved oxygen, fluoresence and transmission, time series measurement in blocks of ten values. Compute mean and standard deviation of block, and temporarily exclude any values further than two standard deviations from mean. Recompute mean and standard deviation of block, and mark as bad any of original ten values further than twenty recomputed standard deviations from recomputed mean. Filter - for each of condutivity (x2), zero-phase-shift low-pass filter of time-constant 0.03 seconds was applyied. For each of pressure, fluorescence, beam transmission, a zero-phase-shift low-pass filter of time-constant 0.15 seconds was applied. Celltm - for each of condutivity (x2), applied a recursive filter with (dimensionless) amplitude 0.03 and time constant of 7 seconds to remove conductivity cell thermal mass effects. Split - casts were split at the deepest point into down casts and up casts. Derive - for both down cast and up cast, potential temperature (x2), salinity (x2)and dissolved oxygen were derived. Binavg - for both down cast and up cast, all measurement were bin averaged in blocks of 0.5 seconds. Ascii_out- for both down cast and up cast, one .asc file and one .hdr file was outputted. After the initial CTD processing discrete independent salinity and oxygen samples, obtained from the CTD rosette, were used to calibrate the CTD sensor data. GEOTRACES is an international programme sponsored by SCOR which aims to improve our understanding of biogeochemical cycles and large-scale distribution of trace elements and their isotopes (TEIs) in the marine environment. The global field programme started in 2009 and will run for at least a decade. Before the official launch of GEOTRACES, fieldwork was carried out as part of the International Polar Year (IPY)(2007-2009) where 14 cruises were connected to GEOTRACES. GEOTRACES is expected to become the largest programme to focus on the chemistry of the oceans and will improve our understanding of past, present and future distributions of TEIs and their relationships to important global processes. This initiative was prompted by the increasing recognition that TEIs are playing a crucial role as regulators and recorders of important biogeochemical and physical processes that control the structure and productivity of marine ecosystems, the dispersion of contaminants in the marine environment, the level of greenhouse gases in the atmosphere, and global climate. GEOTRACES mission is: To identify processes and quantify fluxes that control the distribution of key trace elements and isotopes in the ocean, and to establish the sensitivity of these distributions to changing environmental conditions. Provide a baseline distribution in the Polar Regions as reference for assessing past and future changes. These goals will be pursued through complementary research strategies, including observations, experiments and modelling. The central component of GEOTRACES fieldwork will be a series of cruises spanning all Ocean basins see map below. Section cruises - These will measure all the key parameters (see below) over the full depth of the water column. The sections were discussed and approved by the International GEOTRACES Scientific Steering Committee at the basin workshops. Process Studies - These will investigate a particular process relevant to the cycling of trace metal and isotopes. They must follow the "Criteria for Establishing GEOTRACES Process Studies" and be approved by the International GEOTRACES Scientific Steering Committee. 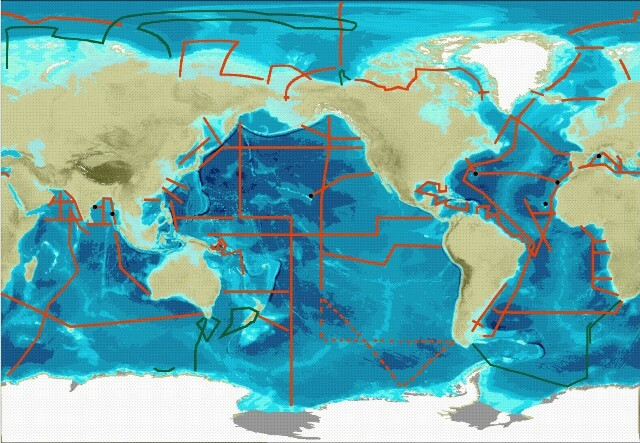 The IPY-GEOTRACES programme comprised of 14 research cruises on ships from 7 nations; Australia, Canada, France, Germany, New Zealand, Japan and Russia. The cruises will not be classified in the same way as the full GEOTRACES programme since the intercalibration protocols and data management protocols had not been established before the start of the IPY. But IPY-GEOTRACES data will still be quality controlled by GDAC and in the majority of cases verified versus Intercalibration standards or protocols. The key parameters as set out by the GEOTRACES science plan are as follows: Fe, Al, Zn, Mn, Cd, Cu; 15N, 13C; 230Th, 231Pa; Pb isotopes, Nd isotopes; stored sample, particles, aerosols.